Nowadays, due to developing of technology, more and more customers are applying electronic commerce to acquire information and purchase of goods and services. However, an integrative evaluation of online purchase from both utilitarian and hedonic perspective is still limited. This study aims to integrate both utilitarian and hedonic factors by evaluating their influence on attitude, satisfaction and repurchasing intention from individuals and firms. This study also focuses on identifying the moderating role of personal type on attitude formation and behaviour intention. The research framework also integrates value, trust and attitude as three of most important variables that may affect consumers’ online purchasing behaviours. This study adopts an online survey approach to get data from 505 respondents who have enough experience on internet shopping. The results indicate that the attitude formation plays a vital role on the determinants of the consumers’ online shopping decision making. The trust attitude, value attitude, and affective and cognitive based attitude all become vital factors that impact customers’ decision significantly. Personality types of thinking and feeling are regarded as the moderators that amplify the influence of antecedents on online shopping behaviours of customers. Since most of previous studies do not integrative utilitarian and hedonic aspects of attitude formation and behaviour intention for internet shopping. The results of the study can provide value insights for academicians to do further validations. It can be also very useful for practitioners to design appropriate marketing strategies for online shopping. Trust, Emotional Value, Utilitarian Value, Affective-based Attitude, Cognitivebased Attitude, Electronic Word of Mouth. Another vital influential factor is the trust which satisfaction for online shopping (Chiu et al., 2009) because online shopping usually involves higher level of uncertainty than shopping intangible store. Online stores should provide a worthy, confident platform through the electronic trade system of the Internet and enhance hedonic value and utilitarian value to online shoppers. Creating customer value is another critical element to an online shopping business's success (Kimet al., 2012). In the past, studies only considered the roles of e-vendor to evaluate value, attitude and trust of online shopping (Hernandez et al., 2009; Chiu et al., 2009; Kim, et al., 2012); the roles of personal characteristics social influence were still lacking in integrated discussion. Bagozzi et al. (1979) presented the dual elements of attitude which argued that both cognition-based and affect-based attitude could provide better explanations of online shopping behaviour (Chang and Wu, 2012). However, past studies usually either focused on the rational decision model or the emotional state of the individual, have very rarely integrated them into a more comprehensive framework. This article tries to develop the integrated framework of online shopping attitudes that include rational and emotional states and make a more complete discussion on online shopping. The customer behaviour model to date is considered as a kind of Input (D)-Output (O)- Processes in which consumers are expected to operate rationally (Jacoby 2002). However, in the mid-1960s, they sophisticated stimulus (S)-organism (O)-respond (R) model was proposed and the important internal factors of the individual were taken into consideration in discussing customer behaviour (Jacoby, 2002). Based on the model of S-O-R model, stimulus was considered as an influence that arouses the individual including all explicit and implicit signals (Eroglu et al., 2001). For online vendor, the personality traits could be the influential stimulus to affect customer’s decision (Sherman et al., 1997; Chang and Chen, 2008; Mummalaneni, 2005). Therefore, the role of online vendors, personality traits and social factors would be considered simultaneously in this study. The internet is a new shopping channel and the technology acceptance is an important opportunity to influence consumer behaviour of online shopping. By searching and sharing information as well as using differentiated services, online stores have an advantage in more rapid delivery, lower prices, and shorter purchasing time (Lee et al., 2011). Customers can find interested products by visiting websites. Besides, the studies discussing the relevant purchase processes within a restrain specific process of buying laptop (Hausman and Siekpe, 2009), virtual goods (Animesh et al., 2011), clothes (Siekpe, 2005) or online travel (Wu and Chang, 2005) ignore the difference between hedonic and utilitarian characteristics of the processes. Most of the studies focused on consideration of online shopping process with a broad framework at intervals the context of online shopping by ignoring hedonic and utilitarian content (Lee and Chen, 2010; Hsu et al., 2012; Zhou, 2013, Zanjani et al., 2016). Many previous studies have discussed the importance of attitude to accept new technology and the empirical results have shown that attitude has influenced the consumers’ decision significantly (Hernandez et al., 2009; Kim and Forstthe, 2008; Enrique et al., 2008). Bagozzi et al. (1979) presented the dual elements of attitude which argued that both cognitive based and affective based attitude could provide better explanations of online shopping behaviour (Chang and Wu; 2012). However, past studies usually either focused on rational decision model or the emotional state of the individual, have very rarely integrated them into a more comprehensive framework. This article tries to develop the integrated framework of online shopping attitudes which include rational and emotional stated and make a more complete discussion on online shopping behaviour. Based on Stimulus-Organism-Response (S-O-R) model, the stimuli could elicit emotional and cognitive response with organism (Babin et al., 2003; Ha and Im, 2012). Both emotional cognitive responses could play a vital role in the relationship between stimulus and behavioral response (Eroglu et al., 2001; Park et al., 2008; Richard, 2005). The integration of cognitive and affective states is often adopted in recent studies. The mediating effects of trust and internal state of affective and cognitive based attitude for the influence of stimuli and the purchase intention are shown in many pieces of empirical studies (Chang and Chen, 2008; Eroglu et al., 2001). The integrated view of the S-O-R model as introduced in this study that both rational and emotional sates, including utilitarian and hedonic value, rational and emotional trust attitude, cognitive based and affective based attitude, are presented to test the mediating effects of the influence of the antecedents of the personal factors, vendor factors, social factors as well as online shopping intention. 1. To investigate how both the rational and emotional states of an individual can impact e-shoppers’ behaviour intentions. 2. To examine the mediating role of utilitarian value and hedonic value, rational trust and emotional trust, and affective based attitude and cognitive based attitude. 3. To clarify the moderating effects of personality types of online customers’ shopping intentions. 4. To provide and verify a more comprehensive model for the explanation of the online shopping behaviour in reference to electronic commerce. This study presents an integrated model to elaborate the customer’s behaviour regarding electronic commerce. It proposes three components in antecedents including individual, vendor and social factors, and these cover the whole economic environment of online trade. The individual factors are classified into personality traits and perceived risk. The personality trait are the important determinants of purchasing intention (Hung and Yang, 2010; Tsao and Chang, 2010). And owing to the uncertainty of new technology and new trade system, individuals’ perceived risks are taken into consideration. In addition, the website is an important platform for online vendors to contact the customers. The characteristics of both traditional stores and online shops such as colour, decoration, service quality and so on have significantly made an impact on customers’ decisions (Bai et al., 2008; Wang et al., 2011; Kim et al., 2010). For the purpose to further investigate the effect of various website designs, both the utilitarian and hedonic aspects related to website designs are included in this study. Furthermore, Internet technology creates a new virtual world and provides some similar living functions to the real world (Qiu and Benbasat, 2009). In the virtual world, the social norms as well as social interactions influence customers’ purchasing intention as it does in the real world (Hansen, 2008; Qiu and Benbasat, 2009). Since previous studies tend to take a piece-meal approach and do not integrate them into a simultaneous investigation. This study integrates these three factors as antecedents to test their impacts on the purchasing intentions of customers in order to more deeply understand the operation modes of electronic commerce. Subsequently, based on the tripartite model of attitude, the interrelationship of cognitionbased attitude, affect-based attitude and behaviour intention are discussed (Bagozzi et al., 1979). The attitude formation of cognition and affect plays a vital role on the determinants of the consumer’s decision making (Edwards, 1990). The new shopping channel of internet vendors provides the benefits of convenience, lower costs, and various types of products; but uncertainty is a huge obstruction for customers to shop online. Under the development of electronic commerce, the influence of trust on internet shopping intention can’t be ignored (Weisberg et al., 2011; Fang et al., 2011; Chang and Chen, 2008). There are multiple dimensions of trust; rational trust focuses on the decision of cost and benefits (Lee and Selart, 2011), while affective trust reflects on whether a person had any personal benefit from the welfare of another (McAllister, 1995). For the purpose of further explanation of the influence of various kinds of trust, this study adopts rational trust and affective trust and tests how the customers’ behavioural intention is impacted by these factors. In order to attract customers, the customers’ value must be created in the process of purchasing online. Internet shopping values can be classified into two psychological categories: Utilitarian shopping value is the degree of shopping goals accomplished, whereas hedonic shopping value is the fun and pleasure of the shopping experience (Kim et al., 2012). Utilitarian shopping value is viewed as rational, goal-oriented, decision-effective, whereas hedonic shopping value is considered as the behaviour of searching happiness, fantasy and awakening (To et al., 2007; Kim et al., 2012). Both utilitarian and hedonic shopping values influence the decision-making behaviour of consumers (To et al., 2007). The formation of attitude is deeply impacted by value (utilitarian value and hedonic value), trust (rational trust and affective trust) and attitude (cognition-based and affect-based), which further influence electronic word of mouth. Website is a vital environment for online store. The vendor can gain many benefits from well-design website as well as interact with the customer and persuade them to purchase online. Kwon et al. (2002) and Moss et al. (2006) examined the relationship between website design and customer behaviour. Website has been proven as an effective tool to enhance customer’s trust, arouse perceived value, affect customer’s reactions, and influence purchasing intention (Eroglu et al., 2001; Eroglu et al., 2003). According to Eroglu et al. (2001) online environment cues can be divided into two categories; one is a high-tasked related online environment cue and lowtasked related cue. The high-tasked related online environment cue includes all website descriptors which can facilitate and enable the consumers’ goal achievement and emphasize the function and content of website design as well as fits the consumers’ utilitarian motivation (Babin et al., 1994). The low-tasked related online environment cue is relatively unimportant to the fulfilment of shopping task and it emphasizes more on the entertainment function. This cue is regarded as a vital factor in increase the hedonic value (Babin et al., 1994). In addition, there are many kinds of dimensions in website designing. The formal aesthetic website presents better performance in order process, legibility, and simplicity of website. It is also closer to the utilitarian and economic practice and properties design. The appeals of aesthetic website are focused on presenting hedonic quality and is more reflected by hedonic, attractive and enjoyable attributes of website design (Bai et al., 2008). H1: The hedonic-related website design has positive effect on the hedonic value. H2: The functional- related website design has positive effect on the utilitarian value. H3: The hedonic- related website design has positive effect on the emotional trust. H4: The functional-related website design has positive effect on the rational trust. H5: The hedonic value has positive effect on the affective based attitude. H6: The emotional trust has positive effect on the affective based attitude. H7: The utilitarian value has positive effect on the cognitive based attitude. H8: The rational trust has positive effect in the cognitive based attitude. In the past studies of customers’ shopping decision, the qualities of website about information, function, useful, ease of use, entertainment and so on are vital determinants (Ha and Stoel, 2012; Kim and Niehm, 2009; Kim et al., 2010). The utilitarian-related websites can provide more useful information which can help decision shopping (Chakaraborty et al., 2003). Except utilitarian-related websites, the hedonic-related websites often provide more entertainment functions and tend to attract online shoppers. When customers visited the website, the entertainment was an important factor to impact perceived satisfaction and purchasing intention (Ha and Stoel, 2012; Chen and Wells, 1999). According to TPE (Theory of Planned Behavior) model, the attitude will positive impact the intention toward the behaviour and then intention will further influence human behaviour (Ajzen, 1991). Farley and Stasson (2003) provided a tripartite model of attitude and indicated that attitude is a multiple components including affective response, cognitive response and behaviour (Chang and Wu, 2012). Cognitive based attitudes are beliefs that are comprised of personal judgments and thoughts with an object (Edward, 1990; Chang and Wu, 2012). Affective based attitudes are emotional evaluations that are made up of emotions and feeling (Edward, 1990; Chang and Wu, 2012). Both cognitive based and affective based attitudes could result in positive behaviour intention. H9: The affective based attitude has positive effect on electronic word of mouth. H10: The cognitive based attitude has positive effect on electronic word of mouth. The website design of internet retailers is viewed as one of the most important physical environment of online shopping. Certain atmospheric quality of online shopping website can affect consumers’ perceived value, trust, satisfaction and purchasing intention (Eroglu et al., 2001; Eroglu et al., 2003). However, online shopping may be moderated by certain interpersonal characteristics variables. Personality is a structure of emotional, rational, behavioral and mental traits that portrayed an individual (Nassiri-Mofakham et al., 2009). Personality research is often discussed with identifying the basic dimensions on building blocks of personality (Miller & Lynam, 2001; Few et al., 2013). Theories in the field of personality research exist different terms of the composition in the basic dimensions, and there are many different structural models of personality including five factor model (FFM) (McCrae and Costca, 1987), Myer-Briggs Indicator Type (MBTI) (Gardner and Martinko, 1996) and so on. H11: The personality types moderate the effect of the hedonic value to the affective based on attitude. H12: The personality types moderate the effect of the emotional trust to the affective based on attitude. H13: The personality types moderate the effect of the utilitarian value to the cognitive based on attitude. H14: The personality types moderate the effect of the rational trust to the cognitive based on attitude. According to Hair et al. (2011), the partial least square SEM (PLS-SEM) has called a great deal of attention in recent years. While CB-SEM aims at reproducing the theoretical covariance matrix rather than on explained variance, PLS-SEM focuses on maximizing the explained variance of the dependent latent constructs. PLS has been recognized as an effective analytical technique, particularly for those studies focusing on prediction of outcomes (Chin et al., 2003). The PLS-SEM tried to maximize the explained variance (R<sup>2</sup> value) of the dependent constructs. Hair et al. (2011) argued that there are several criteria to measure the reliability and validity of the measurement model. The first criterion is the coefficient of determination (R<sup>2</sup>). According to Schroer and Herterl (2009), R<sup>2</sup> value of more than 0.672 is considered to be substantial, 0.33 is described as moderate, while less than 0.19 is considered to be weak. The second criterion is the average variance extracted (AVE) which assess the convergent validity, AVE should be greater than 0.5 to assure that the latent variables can explain more than average (Henseler et al., 2009). The third criterion is the composite reliability (CR), which should be greater than 0.6 to confirm that the variance shared by the respective indicators is robust. The fourth criterion is the Cronbach’s alpha coefficient, which should be higher than 0.7 to confirm the internal consistency of the research construct. The goodness-of-fit (GoF) index is used to measure the overall fitness between the data and the model. Following Vinzi et al. (2010), GoF greater than 0.36 is considered to be large, 0.25 is described as medium, while 0.10 is described as small. The survey conducted an online questionnaire and invited the participants to fill out the internet questionnaire through e-mail and FB invitation. For 505 valid respondents, 273 were male (54.1%) and 232 were female (45.9). Most respondents were aged less than 25 (89.5) and their occupations are students (68%). 412 (81.6%) respondents spent less than 2000 on internet shopping. The detailed descriptive statistics are shown in Table 1. To ensure the dimension and reliability of the research constructs, this study conducted factor analysis, item-to-total correlation, and Cronbach’s alpha tests. Table 2 shows that factor loading of all the questionnaire items are higher than 0.7 (0.708 ~ 0.934), all item-to-total correlation coefficients are higher than 0.5, and all Cronbach’s alpha of all factor are higher than 0.8 (0.821 ~ 0.937), which all exceed the generally accepted guideline from Hair et al. (2011). So that we can conclude that all of the questionnaire items show high degree of internal consistency and their factors are appropriated to be used for further analysis. Using the above criteria, the reliability and validity of the measurement model can be verified. As shown in the Table 3, the coefficient of determination (R<sup>2</sup>), for the 6 endogenous latent variables are as follows: 0.2900 for hedonic value, 0.3711 for utilitarian value, 0.2526 for rational trust, 0.6453 for affective based attitude, 0.7747 for cognitive based attitude and 0.5175 for electronic word of mouth. These R<sup>2</sup> coefficients are considered to be substantial on moderate according to Schroer and Herterl (2009). The AVEs of the constructs are ranged from 0.6747 to 0.8148, which are much higher than the benchmark of 0.5 as recommended. The Conbrach’s alpha coefficients are ranged from 0.8809 to 0.9375, which have fulfilled the criteria of 0.7, and confirm the internal consistency of the measurement items. The CR coefficients are ranged from 0.9115 to 0.9551, which are much higher than the criteria of 0.6, which suggest that the variance shared by the respective indicators is robust. Based on the above discussions, it can be concluded that the reliability and convergent validity of the research model is appropriate, which enables us to proceed to an evaluation of the structural model. The research hypotheses were tested using the parameter estimates of the path between research constructs. Using a sample of 505, a non-parametric bootstrapping procedure was performed with 2500 sub-samples to obtain the statistical significance of each path coefficient for hypotheses testing. The goodness-of-fit (GoF) index is used to measure the overall fitness between the data and the model. Following Vinzi et al. (2010), GoF greater than 0.36 is considered to be large, 0.25 is described as medium, while 0.10 is described as small. The GoF of this structural model is 0.57, which is considered to be large. This result confirmed that the structural model is appropriate with predictive power. The structural model as shown in Figure 1 and Table 4. The empirical results show that the hedonic related website design has significant influence on the hedonic value (β=0.5385; t=21.3006) and the emotional trust (β=0.4589; t=16.1116). Furthermore, the hedonic value has significant influence on the affective based attitude (β=0.2748; t=8.8399), but the emotional trust has no significant influence on the affective based attitude (β=-0.2360; t=3568). The results further shows that functional related website design has significant influence on utilitarian value (β=0.6092; t=22.2938) and rational trust (β=0.6026; t=17.2636). 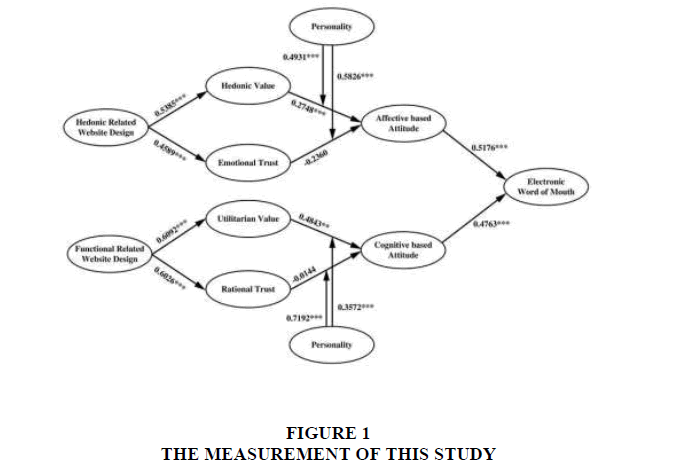 The utilitarian value has significant influence on the cognitive based attitude (β=0.4843; t=3.2621), but rational trust has no significant influence on the cognitive based attitude (β=-0.0144; t =0.0820).Furthermore, the affective based attitude and cognitive based attitude also have significant influence on the electronic word of mouth (β=0.4729; t=10.8197; and β=0.2729, t=5.5706). The moderating effects of personality types has positive significant influence of the hedonic value on affective based attitude (β=0.4931; t =2.3729) and positive significant influence of the emotional trust on affective based attitude (β=0.5826; t=2.3729). The moderating effects of personality types has positive significant influence on the relationship between utilitarian value and cognitive based attitude (β=0.3572; t =2.4632) as well as relationship between rational value and cognitive based attitude (β=0.7192; t =2.7191). This study tried to present an integrated model to elaborate the customer’s behaviour regarding electronic commerce. The results indicate that the attitude formation plays a vital on the determinants of the consumers’ online shopping decision making (Edward, 1990). The trust attitude (Lee and Selart, 2011; McAllister, 1995), value attitude (To et al., 2007; Kim et al., 2012) and affective based and cognitive based attitude (Edward, 1990; Chang and Wu, 2012), all become vital factors that impact customers’ decision significantly. Personality types of thinking and feeling are regarded as the moderators that amplify the influence of antecedents on online shopping behaviours of customers. The partial relationship analysis is carried out to identify the mediating effects of attitude and trust for the influence of antecedent on the dependent variables. Among them, the effects of antecedent on online shopping seem to be close to full mediation by personal innovativeness on online shopping intention. This study aims to identify relationship among the antecedent, mediator, moderators and consequence of online shopping intentions based on the utilitarian and hedonic perspectives. The hedonic-related website design can arouse the hedonic attitude of customers and emotional trust, and the result are in line with previous studies, such as Babin et al. (1994); Bai et al. (2008). The result also found that functional-related website design can arouse perceived utilitarian value and rational trust, and the result reinforces the cognitive and affective aspects of consumer behaviour. And the results are similar to results provided by Kim et al. (2012); Wang (2010). Therefore, the results of this study further proof the applicability of the above two theories that consumers’ hedonic arousal will result in higher intention toward online purchase; while consumer’s cognitive insight will also result in higher purchase intention. The result of this study indicates that individual differences in terms of personality may play a key role on consumer behaviour. The moderating effects of personality types are discussed as follows. According to MBTI (Myers-Briggs Type Indicator) model, the participants could be divided into “thinking” group and “feeling” group. The thinking and feeling group may conduct on the relationship between hedonic and affective based attitude, emotional trust and affective based attitude. For customer with higher “thinking and feeling”, the influence of utilitarian and hedonic perspective on their attitudes will be amplified. MBTI model was used to obverse the relationship between decision pattern and personality types (Barkhi and Wallace, 2007) and in previous studies, personality types reflects people’s difference in decision making behavior (Leonard et al., 1999). The results as shown in this study are line with previous research. Online shopping behaviours of customers are vital issues on electronic commerce. The attitudes of cognition based and affection based attitude formation are considered to impact customers significantly on current online shopping studies (Bagozzi et al., 1979; Argyriou and Melewar, 2011). The comprehensive model that integrates utilitarian and hedonic perspectives to explain the behaviours of customers can be more helpful to the online vendors. Online commerce has become a very important channel for retailers over the last decade, driven by the more rapid delivery, lower prices, and faster purchasing time that it enables (Lee et al., 2011). However, this is also a very competitive market, and thus it is important for online retailers to better understand the factors that affecting the relevant purchase behaviours, such as customer personality traits, perceived risk of online shopping and technology adoption. Several managerial implications could be drawn from the results of this research. First, electronic commerce has become more and more important with the mature technology and mass growth of online users. It is worth observing how to operate the new transaction platform for business vendors. This study tries to extend the current theory foundation and found the comprehensive framework of customers’ online shopping behaviour from utilitarian and hedonic perspectives. The informants thought that the website design should fit the images of products and online vendor in order to attract the customers’ interest. Based on the results, the influence of function-related website on the utilitarian value and the influence of enjoyment-related website on hedonic value. Different types of website design can arouse different values for customers. For the customers who pay more attention to perceived utilitarian, online vendors might make efforts to provide more function explanations of website designs to enhance the values such as safe, convenience, quick service and so on. For the customers who search for hedonic values, the attractive and fascinating website designs are the vital factors. Most customers often bought daily necessities, books or clothes on the online stores, and for online shoppers, these might not be vital decisions to them. According to the study results, the influences of function-related website design on customers’ utilitarian evaluation with low personal involvement are more significant than those with high personal involvement. The function-related websites are influential factors to the inexperienced online shopping customers. The online vendor could enhance the functions of website design to attract more inexperienced customers. The results suggest that marketers need to pay more attention to enhance customers’ interests of the market through the creation of perceived utilitarian and hedonic attitudes. Most of the informants concerned the utilitarian values of speed, discount, and time, while hedonic value of beautiful pictures clear and close to real products, various and interesting introduction. How to enhance customers’ utilitarian and hedonic evaluation is the key to open customers’ mind. Attitude measures are often used to predict the behaviour of consumers (Bagozzi et al., 1979) and multiple dimension views are thought highly (Dubé et al., 2003). Both cognitive and affective attitudes play important roles on customers’ decision making. For the online vendors, it is vital for them to meet the needs of different groups with variety of needs and wants. The experienced and inexperienced groups want different values. Rational customers focus more on utilitarian perspectives, while emotional customers looking for the hedonic atmosphere and environments. The online vendors should provide different service for different customers to enhance customer’s interested. Although the result of this study is interesting and plentiful, there are several limitations and suggestions for the future research. First, the issue of online shopping is still rather undeveloped, the structural map presented in this work is likely to change with the future work of research author. However, examining research from the past decade can still give important suggestions for future work. Secondly, a relatively small of relationship was examined in previous studies. The affects the connection among the studies examined in this work. Although the constructs in all model have all plays as key factors that impact online shopping behaviours, others could also be discussed in future research, such as transaction cost theory, pricing model and so on. Finally, the practical survey collecting 505 respondents and 68% of respondents are students. Although the students are the main group acting on Internet, the overall behaviours of customers may be different from students, and this is issue may need to be validated further. Ajzen, I., & Fishbein, M. (1972). Attitudes and normative beliefs as factors influencing behavioral intentions. Journal of personality and social psychology, 21(1), 1-9. Anderson, B.S., & Eckstein, W. (2013). What’s in store: How technology is transforming the retail industry. Animesh, A., Pinsonneault, A., Yang, S.B., & Oh, W. (2011). An odyssey into virtual worlds: exploring the impacts of technological and spatial environments on intention to purchase virtual products. Mis Quarterly, 789-810. Argyriou, E., & Melewar, T.C. (2011). Consumer attitudes revisited: A review of attitude theory in marketing research. International Journal of Management Reviews, 13(4), 431-451. Babin, B.J., Darden, W.R., & Griffin, M. (1994). Work and/or fun: measuring hedonic and utilitarian shopping value. Journal of consumer research, 20(4), 644-656. Bagozzi, R.P., Tybout, A.M., Craig, S.C., & Sternthal, B. (1979). The construct validity of the tripartite classification of attitudes. Journal of Marketing Research, 16(1), 88-95. Bridges, E., & Florsheim, R. (2008). Hedonic and utilitarian shopping goals: The online experience. Journal of Business research, 61(4), 309-314. Chang, H.H., & Chen S.W. (2008). The impact of online store environment cues on purchase intention: Trust and perceived risk as a mediator. Online Information Review, 32(6), 818-841. Chang, M.L., & Wu, W.Y. (2012). Revisiting perceived risk in the context of online shopping: An alternative perspective of decision‐making styles. Psychology & Marketing, 29(5), 378-400. Chen, Q., Clifford, J.C., & Wells, W.D. (1999). Attitude toward the site. Journal of advertising research, 39(5), 27-38. Chen, Y.Y. (2012). Why do consumers go internet shopping again? Understanding the antecedents of repurchase intention. Journal of Organizational Computing and Electronic Commerce, 22(1), 38-63. Chin, W.W., Marcolin, B.L., & Newsted, P.R. (2003). A partial least squares latent variable modeling approach for measuring interaction effects: Results from a Monte Carlo simulation study and an electronic-mail emotion/adoption study. Information systems research, 14(2), 189-217. Chiu, C.M., Lin, H.Y., Sun S.Y., & Hsu, M.H. (2009). Understanding customers loyalty intentions towards online shopping: an integration of technology acceptance model and fairness theory. Behaviour & Information Technology, 28(4), 347-360. Cunningham, D., Thach, L., & Thompson, K. (2008). Innovative e-commerce site design: A conceptual model to match consumer MBTI dimensions to website design. Journal of Internet Commerce, 6(3), 1-27. Dubé, L., Cervellon, M.C., & Jingyuan, H. (2003). Should consumer attitudes be reduced to their affective and cognitive bases? Validation of a hierarchical model. International Journal of Research in Marketing, 20(3), 259-272. Edwards, K. (1990). The interplay of affect and cognition in attitude formation and change. Journal of personality and social psychology, 59(2), 202-216. Enrique, B.A., Carla R.M., Joaquın A.M., & Silvia S.B. (2008). Influence of online shopping information dependency and innovativeness on internet shopping adoption. Online Information Review, 32(5), 648-667. Eroglu, S.A., Machleit, K.A., & Davis, L.M. (2001). Atmospheric qualities of online retailing: A conceptual model and implications. Journal of Business research, 54(2), 177-184. Eroglu, S.A., Machleit, K.A., & Davis, L.M. (2003). Empirical testing of a model of online store atmospherics and shopper responses. Psychology & Marketing, 20(2), 139-150. Fang, Y.H., Chiu, C.M., & Wang, E.T.G. (2011). Understanding customers satisfaction and repurchase intentions: An integration of IS success model, trust and justice. Internet Research, 21(4), 479-503. Farley, S.D., & Stasson, M.F. (2003). Relative influences of affect and cognition on behavior: Are feelings more related to blood donation intentions?. Experimental Psychology, 50(1), 55. Few, L.R., Miller, J.D., & Lynam, D.R. (2013). An examination of the factor structure of the elemental psychopathy assessment. Personality Disorders: Theory, Research and Treatment, 4(3), 247. Gardner, W.L., & Martinko, M.J. (1996). Using the myers-briggs type indicator to study managers: A literature review and research agenda. Journal of Management, 22(1), 45-83. Ha, S., & Stoel, L. (2009). Consumer e-shopping acceptance: Antecedents in a technology acceptance model. Journal of Business Research, 62(5), 565-571. Ha, S., & Stoel, L. (2012). Online apparel retailing: Roles of e-shopping quality and experiential e-shopping motives. Journal of Service Management, 23(2), 197-215. Hair, J.F., Ringle, C.M., & Sarstedt, M. (2011). PLS-SEM: Indeed a silver bullet. Journal of Marketing theory and Practice, 19(2), 139-152. Hansen, T., Jensen, J.M., & Solgaard, H.S. (2004). Predicting online grocery buying intention: a comparison of the theory of reasoned action and the theory of planned behavior. International Journal of Information Management, 24(6), 539-550. Hausman, A.V., & Siekpe, J.S. (2009). The effect of web interface features on consumer online purchase intentions. Journal of Business Research, 62(1), 5-13. Henseler, J., Ringle, C.M., & Sinkovics, R.R. (2009). The use of partial least squares path modelling in international marketing. In New challenges to international marketing (pp. 277-319). Emerald Group Publishing Limited. Hernandez, B., Jimenez, J., & José Martín, M. (2009). Adoption vs. acceptance of e-commerce: Two different decisions. European Journal of Marketing, 43(10), 1232-1245. Hsu, C.J. (2008). Dominant factors for online trust. In Cyberworlds, 2008 International Conference on (pp. 165-172). IEEE. Hsu, C.L., Chang, K.C., & Chen, M.C. (2012). Flow experience and internet shopping behavior: Investigating the moderating effect of consumer characteristics. Systems Research and Behavioral Science, 29(3), 317-332. Hung, J.H., & Yang, Y.C. (2010). The relationship between personality traits and online shopping motivations. Social Behavior and Personality, 38(5):673-680. Institute of Information Industry, Market Intelligence (MIC) ( 2004). The 2004 Internet User Behavior Analysis. Jacoby, J. (2002). Stimulus-organism-response reconsidered: an evolutionary step in modeling (consumer) behavior. Journal of Consumer Psychology, 12(1), 51-57. Kim, C., Galliers, R.D., Shin, N., Ryoo, J.H. & Kim, J. (2012). Factors influencing Internet shopping value and customer repurchase intention. Electronic Commerce Research and Applications, 11(4), 374-387. Kim, H., & Niehm, L.S. (2009). The impact of website quality on information quality, value, and loyalty intentions in apparel retailing. Journal of Interactive Marketing, 23(3), 221-233. Kim, J.U., Kim, W.J., & Park, S.C. (2010). Consumer perceptions on web advertisements and motivation factors to purchase in the online shopping. Computers in human behavior, 26(5), 1208-1222. Kim, J., & Forstthe, S. (2008). Adoption of virtual try-on technology for online apparel shopping. Journal of Interactive Marketing, 22(2), 45-59. Kwon, O.B., Kim, C.R., & Lee, E.J. (2002). Impact of website information design factors on consumer ratings of web-based auction sites. Behaviour & information technology, 21(6), 387-402. Lee, K.C., Chung, N., & Lee, S. (2011). Exploring the influence of personal schema on trust transfer and switching costs in brick-and-click bookstores. Information & Management, 48(8), 364-370. Lee, S.M., & Chen, L. (2010). The impact of flow on online consumer behavior. Journal of Computer Information Systems, 50(4), 1-10. Lee, W.S., & Selart, M. (2011). The impact of emotions of trust decision: in Handbook on Psychology of Decision-Making. Nova Science Publisher. Leonard, N.H., Scholl, R.W. & Kowalski, K.B. (1999). Information processing style and decision making. Journal of Organizational Behavior, 407-420. Mahnke, R., Benlian, A., & Hess, T. (2014). Flow experience in information systems research: Revisiting its conceptualization, conditions, and effects. ICIS 2014 proceedings. McCrae, R.R., & Costa, P.T. (1987). Validation of the five-factor model of personality across instruments and observers. Journal of personality and social psychology, 52(1), 81. Miller, J.D., & Lynam, D. (2001). Structural models of personality and their relation to antisocial behavior: A meta‐analytic review. Criminology, 39(4), 765-798. Moss, G., Gunn, R., & Heller, J. (2006). Some men like it black, some women like it pink: consumer implications of differences in male and female website design. Journal of Consumer behaviour, 5(4), 328-341. Nassiri-Mofakham, F., Nematbakhsh, M.A., Ghasem-Aghaee, N., & Baraani-Dastjerdi, A. (2009). A heuristic personality-based bilateral multi-issue bargaining model in electronic commerce. International Journal of Human-Computer Studies, 67(1), 1-35. Ou, C.X., & Sia, C.L. (2010). Consumer trust and distrust: An issue of website design. International Journal of Human-Computer Studies, 68(12), 913-934. Pengnate, S.F., & Sarathy, R. (2017). An experimental investigation of the influence of website emotional design features on trust in unfamiliar online vendors. Computers in Human Behavior, 67, 49-60. Qiu, L., & Benbasat, I. (2009). Evaluating anthropomorphic product recommendation agents: A social relationship perspective to designing information systems. Journal of Management Information Systems, 25(4), 145-182. Schroer, J., & Hertel, G. (2009). Voluntary engagement in an open web-based encyclopedia: Wikipedians and why they do it. Media Psychology, 12(1), 96-120. Sherman, E. Mathu, A., & Smith, R.B. (1997). Store environment and consumer Purchase Behavior: Mediating role of consumer emotions. Psychology & Marketing, 14(4), 361-378. Siekpe, J.S. (2005). An examination of the multidimensionality of flow construct in a computer-mediated environment. Journal of Electronic Commerce Research, 6(1), 31. Singh, N., Fassott, G., Chao, M.C., & Hoffmann, J.A. (2006). Understanding international web site usage: A cross-national study of German, Brazilian and Taiwanese online consumers. International Marketing Review, 23(1), 83-97. Spears, B. (2014). Top 6 tech trends in the fashion industry. Apparel Magazine. To, P.L., Liao, C., & Lin, T.H. (2007). Shopping motivations on Internet: A study based on utilitarian and hedonic value. Technovation, 27(12), 774-787. Tsao, W.C., & Chang, H.R. (2010). Exploring the impact of personality trait on online shopping behavior. African Journal of Business Management, 4(9), 1800-1812. Vinzi, V.E., Chin, W.W., Henseler, J., & Wang, H. (Eds.). (2010). Handbook of partial least squares: Concepts, methods and applications. Springer Science & Business Media. Wang, E.S.T. (2010). Internet usage purposes and gender differences in the effects of perceived utilitarian and hedonic value. CyberPsychology, Behavior and Social Networking, 13(2), 179-183. Wang, Y.J., Minor, M.S., & Wei, J. (2011). Aesthetics and the online shopping environment: Understanding consumer responses. Journal of Retailing, 87(1), 46-58. Williamson, O.E. (1993). Calculativeness, trust and economic organization. The Journal of Law and Economics, 36, 453-486. Wu, J.J. & Chang, Y.S. (2005). Towards understanding members' interactivity, trust, and flow in online travel community. Industrial Management & Data Systems, 105(7), 937-954. Zanjani, S.H., Milne, G.R., & Miller, E.G. (2016). Procrastinators online experience and purchase behavior. Journal of the Academy of Marketing Science, 44(5), 568-585. Zhou, T. (2012). Examining mobile banking user adoption from the perspectives of trust and flow experience. Information Technology and Management, 13(1), 27-37.